Radiotherapy (RT) plays an important role in the multimodality treatment of a number of pediatric tumors, both in the curative and palliative settings. In general, treatment paradigms in pediatric oncology look to risk-stratify and response-adapt treatment for patients, with the overarching tenet of delivering the minimum treatment required for cure. This paradigm looks to minimize long-term sequelae in those treated at young ages, the majority of whom will be long-term survivors. The late consequences of radiotherapy, dependent on the treated site, can include cognitive, endocrine, growth, vascular, and fertility effects and the induction of second malignancy. In recent decades, RT treatment delivery techniques have become increasingly sophisticated. It is now possible to deliver complex treatments where the prescribed dose is sculpted to the target, and normal tissues are maximally spared moderate to high doses. This is achieved through increased accuracy and precision in target definition and the ability to better visualize the target during the course of treatment, thereby reducing geometric uncertainties in treatment delivery. Imaging plays an integral role in the ability to deliver such accurate and precise RT treatment. Phase I/II study of [124I]mIBG PET/CT in neuroblastoma. 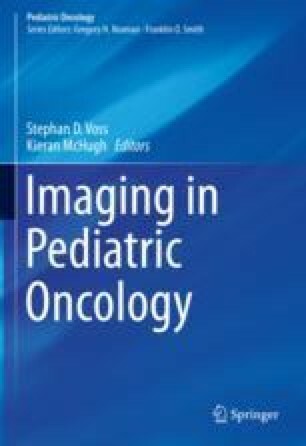 Available from: https://www.hra.nhs.uk/planning-and-improving-research/application-summaries/research-summaries/phase-iii-study-of-124imibg-petct-in-neuroblastoma/. Trial Evaluating and Comparing Two Intensification Treatment Strategies for Metastatic Neuroblastoma Patients With a Poor Response to Induction Chemotherapy (VERITAS). 2017. Accessed on 1 Oct 2017. Available from: https://clinicaltrials.gov/ct2/show/NCT03165292.